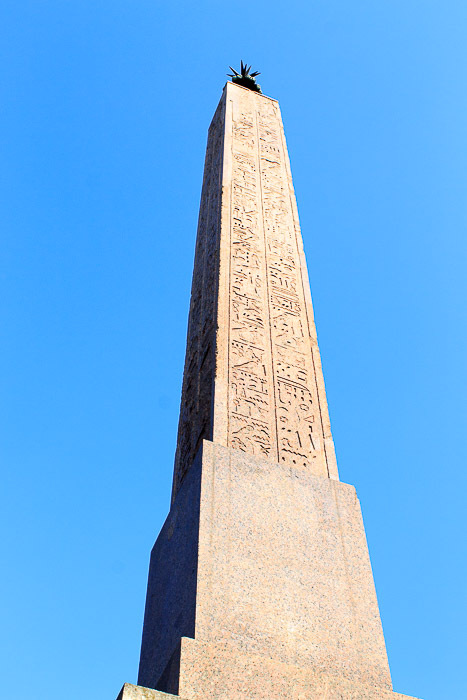 The Pincian Obelisk is 30.3 feet tall (56.6 feet with base). It was commissioned and brought to Rome by Hadrian (117-138 AD). 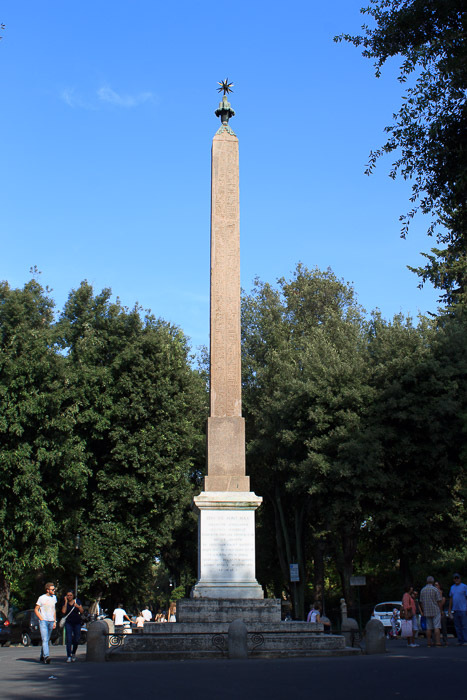 The hieroglyphics were probably cut in Rome, and state that the obelisk was erected on the site where Antinous was buried, just outside the limits of the city, but it is uncertain whether this means that the body of Antinous was actually brought to Rome or not; the grave may have been in Tivoli. Antinous was the beautiful young man who emperor Hadrian adored, and who drowned in the Nile while saving Hadrian's life. The obelisk was moved to Rome by Elagabalus (218-222 AD) to decorate the spina of the Circus Varianus, a chariot racing track built by Caracalla. The fragments of this obelisk were set up in 1570 in the vigna Saccoccia outside Porta Maggiore at a point marked by an inscription recording the fact, which was fixed to one of the piers of the Aqua Claudia, about 1180 feet east of the Aurelian wall. This became one of the piers of the Acqua Felice in 1585. The original site of the obelisk was probably not far from this point. In 1633 it was removed by the Barberini family to their palace, and afterwards presented to Clement XIV. It lay in the Giardino della Pigna in the Vatican until 1822, when Pius VII erected it on the Pincian Hill where it still stands. See all Pincian Obelisk photos.